It’s a case that divided Atlanta and people all across the world. Troy Davis, an African-American, was executed in 2011, convicted of killing white police officer Mark MacPhail in Savannah more than 20 years earlier. His defenders were passionate about his innocence. His critics were adamant in his guilt. Playwright Lee Nowell has crafted an original play about the case, which seems now as timely as ever. 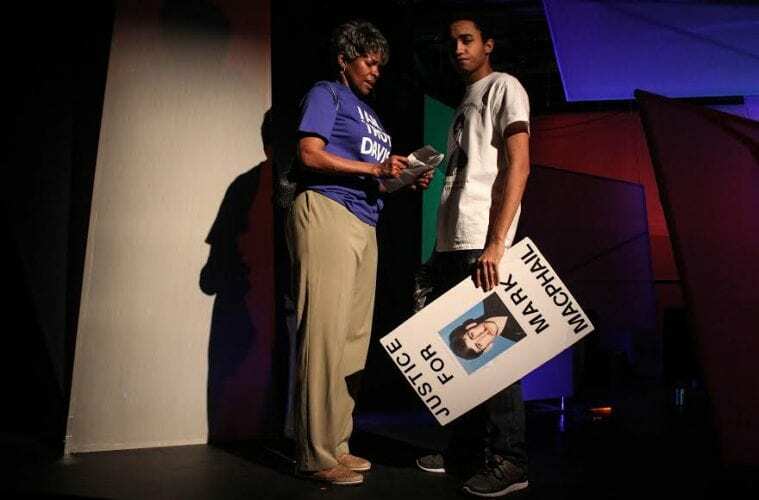 Now running through May 1 at Synchronicity Theatre in a world premiere production, Beyond Reasonable Doubt: The Troy Davis Project doesn’t use either Davis or MacPhail as characters. Instead, Nowell uses characters that she has envisioned after four years of research. In an interesting concept, Nowell has decided to alternate, from night to night, the order of her two acts, one of which leans towards Davis’ guilt and the other his innocence. Both prove to be equally compelling. In the first hour, Alison (Lane Carlock) is interrupted from some down time on the sofa by a knock on her door. It’s Lucy (Cynthia Barker), a representative from Amnesty International gathering signatures to protest against Davis’s impending execution. Alison knows of the case and is a little wary of participating. Yet she ultimately gets involved. Her boyfriend of 10 years, Bob (Eric Mendenhall), is dead set against the idea, convinced Davis is guilty. In the second hour, Curtis (Stephen Ruffin) — a young man attending Morehouse — locks horns with grandmother Mary (Terry Henry), with whom he is living. Why he is living with her is a reason that should not be spoiled here but it has an effect on how these two view the case. The more we find out about the two, the more intriguing their story becomes. Curtis feels racism is no longer an issue. 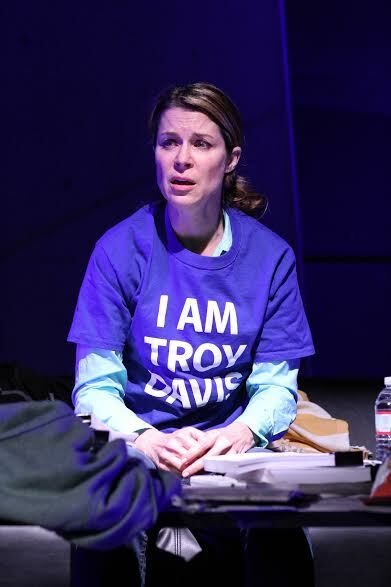 In one memorable moment, he says, “Troy Davis is not my people.” Yet just as Alison struggles when she reads trial transcripts, Curtis too is aghast when he finds out more information. Lane Carlock as Alison, who becomes obsessed with the case. A protest just prior to Davis’s execution — staged in both halves — is when these two stories briefly crisscross. Barrett Doyle’s set features large shards of glass throughout the stage. At regular intervals, newspaper headlines, transcripts, blog posts and pictures are projected onto these panels. It can be highly theatrical. Playwright Nowell (named Synchronicity’s managing director last year) has clearly done her homework. This is a polished, researched work. It’s also very balanced. The play touches on the issues of capital punishment and inequalities in the justice system. It also does a masterful job of capturing how sound bites of information can influence public perception. It’s all staged quite vividly and fluidly by director Rachel May, who gets believable performances from her ensemble. Carlock and Mendenhall bring a real tension to their already wounded relationship while Henry and Ruffin have a genuine grandmother-grandson bond. The rest of the cast includes John Benzinger, Eddie Bradley, Jr., and Danielle Deadwyler, who brings her usual conviction to a number of small roles. The production is followed almost nightly with talkbacks and discussions. Given the subject matter and information, it’s welcome. It’s a play that audience members will want to talk about after. When it’s over, it hasn’t answered all the questions but it certainly does a hefty job of presenting cases for both sides — and showing how the case affected different kinds of people. The only problem really is the aftermath. Beyond Reasonable Doubt: The Troy Davis Project gets the job done — and well — but it leaves you wanting just a little more. The framework makes it more informative than emotional. It’s a play that often cries out for more passion and fewer facts. Some tinkering with the structure might help. Nonetheless, as a snapshot of a case that people are still talking about, it’s riveting — and vital.